Wikiproa , Proa Community site (wiki). This site moved to http://proa.me/wiki for a while, because of a better wiki platform. Unfortunately this has now disappeared. There is however a backup of this new wikiproa at this location. Proa File International , Proa mailing list, friendly and very active (in bursts, sort of). Proafile.com forums , Newer proa forum. Some really creative people on here, check out the design section. This forum is nicer to use bu doesn't have the same number of members as the mailing list. canoes of oceania , The blog of Harmen Hielkema. Outrigger sailing canoes , Gary dierkings blog, don't miss!! More About American Proas , A duckworks article on the proa. Grillabongquixotic’s Blog , Follow the amazing adventures of Chris as he sails his proa down the Mexican coast! These boats are all developed for fisheries programs etc. Search this page for more stuff. SPC Boat Plans Collection, plans for a whole range of boats, including many outrigger canoes!! Buy a poster of the historic proa Cheers! Based on a painting by Bruce Alderson. Video: Taratai, large traditional proa with double oceanic lateen rig. Video: Proa Gilbert Archipel Old footage. Includes shunting! Video:Kids in Canoe Singing, together in a small canoe. Don't seem to worried about having no freeboard. Video: Traditional navigation & sailing in Ifaluk, Micronesia, Description includes link to full video. White Heron , 14 ft proa in Auckland's National Maritime museum, halfway down the page. Small canoe (last 2 pics on page). Tebwaaras Canoe , A kiribati style proa, in plywood! Some construction pics. Same as above, bigger pics! Canoes of the Kiribati Islands , How to build a traditional Micronesian flying proa. Traditional Micronesian Navigation Collection , A lot of great pictures in the collection. Video: Marshall islands canoe Launching (and capsizing) small one man proa. Video: Marshallese Canoe race Launching small one man proas in very strong wind. Video: Marshallese Sailing Canoes Fantastic on board footage. Walap in Enewetak [pdf, 6mb], Measuring, Lashing and Construction Techniques of the Voyaging Canoes of Enewetak Atoll. Video: Tacking in a Marshallese Sailing Canoe, finally, a video showing the shunt!! Video: Marshall Islands Outer Island outrigger wa kurkur, Onboard footage. Marshallese Canoes Today, fantastic documentary on the role of marshallese canoes in modern culture. Video: Practicing the Shunt , Same proa as above. Check out this youtube channel for more videos. Also this facebook page. David A's Photos' photostream , Heaps and heaps of marshall island photos. Mieco Beach Yacht Club , Here traditional canoes are still raced. I worked out from a race's results they were about 70% the speed of a hobie 16. Hawkey Happenings, WAM Weekend , Recent pics of WAM Canoes. Waan Aelon Kein , Nice article about a 52 foot Marshallese Walap (voyaging canoe), good stuff on the physics of an asymmetrical hull. Modern Marshallese Canoes, a photo essay. Life in the Republic of the Marshall Islands , A book viewed in google books. Marshallese Participate In International Festival Of Canoes , Looks like a plywood marshallese canoe. WAAN AELÕÑ IN MAJEL , New WAM site, Canoes of the Marshall Islands. Waan Aelõñ In Majel , Old WAM site. Video:Tuata – canoe races on Takuu, Papua New Guinea Narrated video, includes shunting and a race. Interestingly these have a rig more typical of marshall islands / kiribati canoes. Video: Ika's canoe Shows the lashing of the outrigger to a new canoe. Video: The Sharkcallers of Kontu (1982) pt. 1, Papua New Guinea, big fish for a small canoe. Video: Srilanka shrimp fishing Onboard footage sailing amidst a giant fleet of orus. Video: Sri Lanka,fishing trip on a wind powered PROA (01) Also watch the other parts! Video: Sri Lanka Fishing , The Oru, a unique outrigger canoe. Video: Sailing aboard a Faluga Island Canoe, Fiji, includes shunting and raising the sail. On board. Video: Faluga canoe, filmed from a chase boat. Camacau.flv , Old footage of fijian camacau. Video: Alefa Pirogue, fast model outriggers. Remote Pacific: Yap Sailing Boats, This is the “Yap Day” sailing canoe demonstration in Colonia on March 1997. Chamorro and Carolinian Sailing Canoes , Building pics too. Apparently there is a fibreglass class called the Tasi 20. Alunita’s Distant Cousin , A small ply outrigger canoe in the pacific. Springing from the past straight into the future , A small proa build in the pacific. Dory type hull with traditional rig. photo, Boys are rigging a small sailing canoe. Traditional sailing canoes in Lau , Book in google books. Building an Outrigger Canoe , Building a balsa dugout in panama. Carolinian canoe , Some great pictures. Wipke's Bigiw Bangkaa , Phillipine double outrigger canoe. 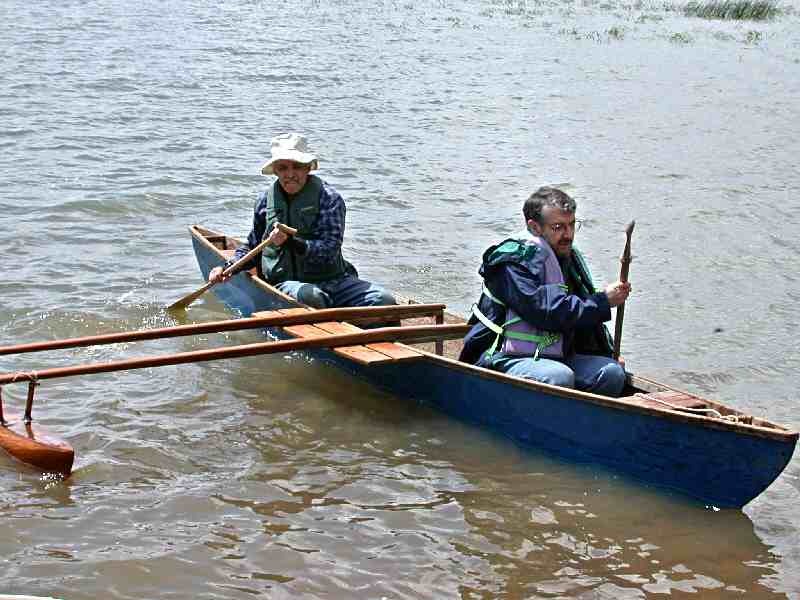 Iloilo Paraw Regatta , Philliping double outrigger canoe, tacking. Video of the above regatta, what a spectacle! One last cool pic from the above. The Jack Tobin Collection , Historic photo archive. Video: Pirogue à voile, tacking outrigger canoe. Video: Proa 42 18 07 2014 Interesting little tacking outrigger, looks like a production boat. Same boat, and more on the same channel. Journey2Live, Adventures in a Tahiti Wayfarer outrigger canoe. Video: Sailing Polynesian outrigger canoe., a traditional looking tacking outrigger. Sztormowe sztrandowanie łódek polinezyjskich w Ustce 2 proas coming onto beach in heavy wind. Traditional style boats, one is a p5. Video: vulkán balatoni proa, Hungarian outrigger canoe, ply. Video: Balaton Proa, same boat? Video: Sailing my proa, three board tacking outrigger canoe. Video: pod zaglami Baltic-Proa, interesting design. Little hard chine proa with oceanic lateen. Same boat, close up view. Apparently this litte boat is called Zabawa, check out the rest of the website too (some good links, but is in polish). Video: Balaton Proa., Flying the hull on a nice wooden hull. Shaped kind of like a kayak. Video: Sail the NINJA - a fast tacking proa, modern and well executed tacking outrigger. There's a few more videos of this one on youtube. Video: Salamba Sailing, crab claw sail includes shunt. Video: Outrigger Sailing Butley, sailing with a small rig. Uploader has two more videos. Hinged Bruce foil proa, on boatdesign.net, A great looking boat made from a cut and joined beach cat. Very well executed. Here is the buildign thread with construction photos, although all in german (not the pics;-)). Splinter, skin on frame outrigger canoe. Plans for sale, forum thread. Murray River Trip, on Mbuli design proa. Video: Proa Mara Mara na Jamnie , Small proa with crabclaw sail, made from sheet plastic. Another one! Video: vulkán balatoni proa , Hungarian proa, slidshow of pictures. Video: Proud Mary - shunting proa , Bolger inspired 20 foot proa with Gibbons/Dierking rig. Video: Wooden Boat Builders Meeting in Takashima Japan , Includes a crazy little tacking outrigger. Video: Willi`s Proa - Besini , Proa with a cabin and Gibbons/Dierking rig made from windsurfing rigs. Video: Proa Pipeline , A small modern looking proa made with pvc pipe and parking cones. Has a lateen sail on a fixed mast, and a steering oar. Aye Aye , 10m crab claw cruising proa in Australia. Pinoy Forums, Skin on frame proa , Some pictures and details. Says the building instructions can be supplied if anyone wants them! Pinoy Forums, 21 foot proa. Wes White's Pacific Proa , And a whole lot of other boats, at a messabout. Prao Petrel , A cool MBuli like proa, sailing in france. Lots of videos and pictures. Sailing Tin Canoes , There's some more videos on this if you search. arturogatto's photostream , Some nice proas and outrigger canoes in italy. Salmo 19 , Also plans for some outrigger floats / catamaran hulls on this site. Toroa , This page was removed from Gary Dierkings site, but still available here. Mi6 and Vortex proa , Innovative design, and discussion. Strip Build proa , Really small traditional based design. A real work of art! Wa'apa in Ghana , 24 foot shunting wa'apa with twin balanced lug sails. Worn outrigger canoe in the pacific. P8 proa - "Kalapuna" , From the designer of the p5 proa, here is the p8 proa! simple flat bottom hull design, oceanic lateen. arturogatto's photostream, Flickr , Various proas and tacking outrigger canoes. And a venetian gondola..
Leoncino , Italian 10 foot class tacking outrigger. Fregoli , Italian 10 foot class tacking outrigger. Al Demany Chiman , Skin on frame outrigger canoe on chine blog. Appetite for Destruction , A very nice proa, Flickr album. Sailing adventure in Waiheke , …Which you can read about here! Sub Arctic proa sailor , Various modern style proa projects. Construction of the proa Mango , A dory hull shaped 14 foot proa. Yucatan Proa , This is about a voyage in a folding proa. Cool. 1996 AYRS Publication , A 3 part proa by Chris Hughes that steers by turning the back hull section. Project Windrigger , Tacking canoe. Seattle to Alaska by hasty outrigger canoe , Tacking makeshift outrigger. More ACDC , More ACDC at the messabout. A Proa Perspective , P52 by the same guy as ACDC. A much bigger boat. 3 board canoes in Rarotonga. Cheers , An ocean-racing atlantic proa. "Flying Proa" of the Marianas Islands , A pretty inacurate proa report, I think. Pjoa , A traditional style proa, more on wikiproa. Mbuli, on Chesapeake light craft. Inigo Wijnen , Environmentalist and proa builder, now building Gaia's dream, a big 22m proa. JB Yacht Designs , A modern 5m proa with a junk rig. K/Proa , A pulic domain design for a big force balanced proa. Great model designs. Stoaproa , A take-apart proa. Here's part two. Fijian Thamakau Project , A beautiful skin on frame proa. Proadesign.com, fritz roth , A modern force-balanced proa. The Magpie , Building a traditional style proa using modern materials. Bororo , A beautiful T2 design Proa. Taylor Pacific Proa , An experiment in variable geometry. Arara , A small tacking outrigger, steers by canting the sail. Grillabongquixotic’s Blog , Travails with a T2 inspired proa. 16ft commercial outrigger , High performance with 12sqm of sail! BIG ZEN , A minimalistic live-aboard proa. Outrigger Canoe Sailing in New Zealand , Sailing on Toroa. Baby proa , Built as a dinghy for Des Jours Meilleurs. Doug Weir's Proa Project for Paddling Sailing and Marine Adventure , A small v hull proa. Blue proa , Small, simple and traditional style. Te Hau , A traditional style kiribati proa, in plywood. The p5 proa , Free plans for a stitch and glue proa. Video: Mój film3 , I'm pretty sure this is a p5 design. A leeboard has been added. The same user has uploaded several more videos of this proa. Video: Proa Tuvalu on its very first ride , Another p5 video! There are two more videos uploaded showing the boat in more detail. Video: Proa Lili'uokalani sailing solo, ama flying , Another video! Ama flying. Proa első evezőcsapások Launching a 16ft wa'apa. Looks like it's completely to plans. Videos: Wa'apa sailing in Ghana , 3 part with twin balanced lugs and lots of bamboo. Video: Proa "Kiribati" extreme high speed outrigger sailing boat, part 1 , 2 part, pretty much to plans (and NOT that extreme I'm afraid). Video: Proa Baby Blue 1 , An ulua modified with raised freeboard and self bailing footwells. More videos from the same user. Melanesia , A James Wharram design outrigger canoe. Ready for the launch!, 'Malu' Photo album. Gallery of Melanesia build. Interesting ama construction. Riques OUTRIGGER Malolo , The writeup to go with the pics. South West PCA Meet 2000, Plymouth, Cornwall , First launch pics, and some building pics. Video: Pjoa robi zwrot... , Another video of Pjoa. In yellow?? Includes shunt. Video: proa with a new sail , Also check out the other proa videos of this person. A report on a T2 Poa , A long and detailed evaluation of a modified version of the T2 proa, which has seen a lot of sea miles. Lots of pictures. Video: Chris' Adventures in Mexico. , A video of above proa, showing shunting manouvre. Video: Sailing a Flying Proa , Another of this boat, uploaded by the Chris himself. Video: Kokomo. Yes, even Chris has to work for a living. Shows sail raising and a shunt, all very streamlined. Another quick video. Salamba, 6 m proa with cabin. Outrigger Sailing Canoes , Plans for sale for some great proas and outrigger canoes. Gary Dierking. A folding proa , Plans for the yucatan folding proa. P3 Proa , Free plans for a small (10 foot) proa. More here, plus some building pics. The Last Sailing Canoe of Mokil, Documents the construction of a traditional proa. Video: Shunting a harriette proa. , Ultra modern fast schooner design by rob denney. Video: Sailing a jukung replica in rough seas. Video: changer d'amure , A sort of cross between a hawaian canoe hull and shunting outrigger with crab claw. Includes shunt. Video: Cap à l'Est au portant , The same boat, converted to tack, and filmed from the jukung! Video: Claire découvre sa voile , Tahitian style rig. These above videos are all from the same user on vimeo, and there are many more! Video: 20ft. Proa , With lateen rig. Video: AD-scull. high speed sculling 01 , Interesting small outrigger getting high speed with sculling oar. Bororo courtise les flots - Youtube V2 , Really nice video of a T2 design proa. 1990 Voyage of ULLA, part 8: Kuria Island in Kiribati , From 8:30 onwards. Some canoes sail past, one person on each. Kind of rough water. One has a float tied on the outrigger. 1990 Voyage of ULLA part 9: Tarawa to Port Vila , Starts with some of the same scene as above. Ailuk Atoll , 1:30-2:30 is good. Cool little proa at 3:18. Photo slideshow, also shows strange little rudders on traditional proas. Camacau.flv , Old footage of fijian camacau. The same user has also uploaded a video of Taratai (a large double masted proa), a Te Puke sailing canoe, and more. Sakman Part 1 , Some history and explanation in front of a nice canoe model. Remote Pacific: Yap Sailing Boats , 1997 Footage of sailing canoes. Kite Fishing in Melanesia , From a tepuke type of outrigger. Marshallese Sailing , Recent video of marshal island canoe!! Marshallese tacking, fall. , The risks of shunting! Marshall Islands Outrigger Canoe , Another recent video from onboard a small walap (korkor?). Vezo Village sailing out , Tacking outriggers from madagascar, with an interesting sprit rig. Proa na Bałtyku - Youtube , A polish proa. Stitch and glue asymmetric design. Canoa a vela - Youtube , Canadian canoe with outrigger and lateen sail. Marshall Islands Outer Island outrigger wa kurkur , Onboard view of fast canoe. petit prao , Small proa of Des Jours Meilleu. Sailing for Sustainability , Focusses on the Drua, if it could be used today. AD-Scull, high speed sculling , Fast outrigger sculling. Taimaui Society: Polynesian sailing , Some interesting proas. Proa hull shapes , a yahoo group discussion on proa hull shapes. Foam and Fiberglass Ama Construction , How to make an ama, Gary Dierking style. Building Narrow Amas , Some construction tips for trimaran amas. Would make an interesting proa hull shape as well. Seabbattical proa, Kelsall designed 16m proa currently under construction. P12 Proa, by the designer of Kalapuna, p5 and p3. Some more info and launch pics. Nixe, Fantastic build log of a beautiful proa. Near the end there are some videos too! Park it, Dad , Interesting account of cruising on the proa Kauri. Nomad , A design for a minimal sleep aboard proa. Upokorua , Big proa, tried to cross the tasman. Captain Kiko's proa , Lapstrake, junk rigged proa. Des Jours Meilleurs , A very successful live-aboard proa.